The original Moulin Rouge the year before it burned down, Paris, France, 1914. On 6 October 1889, the Moulin Rouge (English: The Red Mill) opened in the Jardin de Paris, at the foot of the Montmartre hill. Its creator Spaniard Joseph Oller and his manager Charles Zidler were formidable businessmen who understood the public’s tastes. The aim was to allow the very rich to come and slum it in a fashionable district, Montmartre. Nicknamed “The First Palace of Women” by Oller and Zidler, the cabaret quickly became a great success. The facade was decorated with glittering electric lights, which were a novelty at the time, with a huge red windmill at the very front of the building. The red windmill was designed to indicate the history of Montmarte, a village that once had many windmills in it. A castle was built in a Gothic style right next to the windmill. 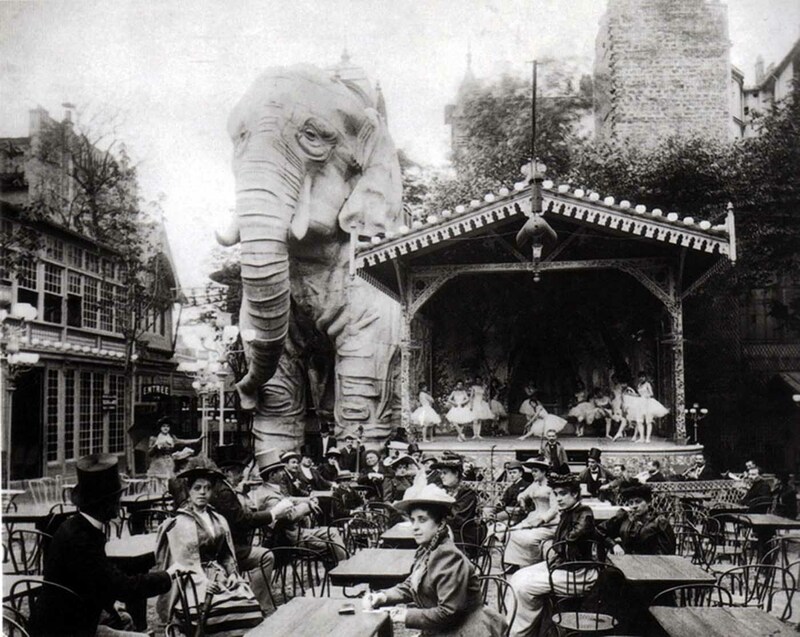 The garden and it’s al fresco café was known as the Jardin de Paris Elephant, after the founders purchased a giant stucco elephant they had seen exhibited at the Paris Universal Exhibition of 1889. At the Moulin Rouge, the elephant served as a luxurious opium den where for a single franc, gentlemen could enter by way of a spiral staircase inside the leg and be entertained by belly dancers. 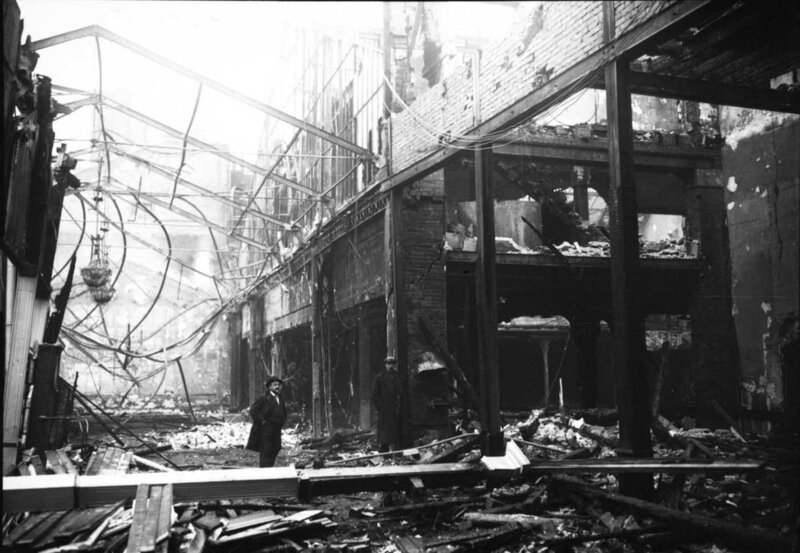 Photo of inside the Moulin Rouge after it was ravaged by a fire in 1915. The rebuilt Moulin Rouge finally reopened in 1921. Unlike in Hollywood depictions of the Moulin Rouge, it is not true that women had to sell their bodies to make a living. They simply had to make conversation, entertain men and be the life and soul of the party. They were very skilled at the art of seduction and often formed long-lasting relationships with the European elite. They were also considered celebrities and disliked by many people. The press followed their every movement. This certainly added to the perception that many Parisians already had of these women and this venue. Moulin Rouge operettas were well-known as well as the most famous cabaret performance: the Can-Can. The Can-Can was a dance involving an indecent display of women lifting up their legs and skirts. The most famous of these dancers was Louise Weber, or La Goulue (the glutton), so named because she was known for taking people’s drinks as she danced around their tables. She performed with her dance partner Jacques Renaudin, also known as Valentin le désossé (the boneless), but he was never as big a sensation as La Goulue. The patrons loved her for her charming yet audacious behavior in her dance routines that included raising her legs so high to kick hats off of men’s heads. At the Moulin Rouge, the elephant served as a luxurious opium den where for a single franc, gentlemen could enter by way of a spiral staircase inside the leg and be entertained by belly dancers. 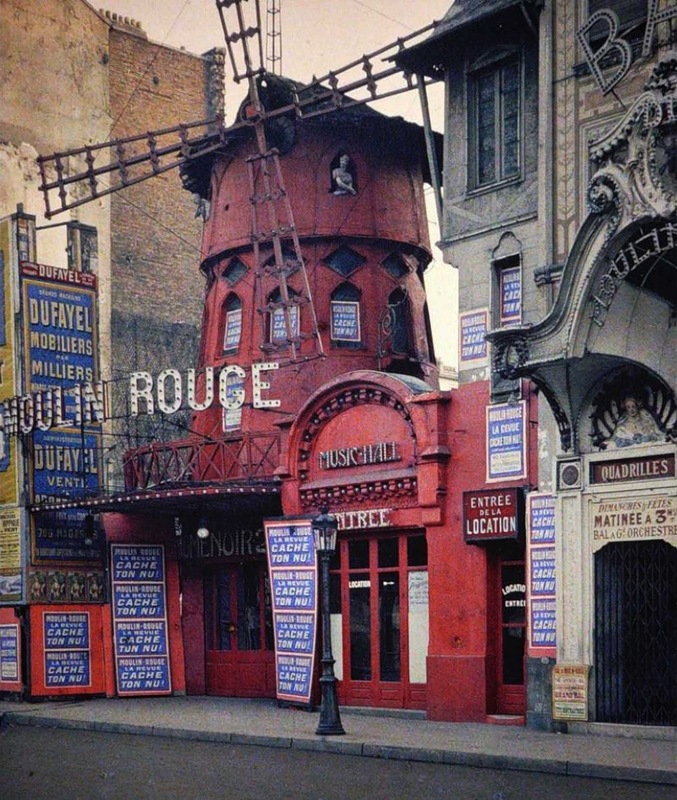 The Moulin Rouge went through many transformations over the years as it tried to find itself a place in French society. After World War I, there were many musicals and cabaret shows. However, their main show runner’s death seemed to also signify the death of the Music Hall, and by extension, the Moulin Rouge. It was turned into a cinema for a bit and revitalized in the 1950’s with a diner-spectacle show. Today, the Moulin Rouge is a tourist attraction, offering musical dance entertainment for visitors from around the world.